A Safari round Africa -in Taynuilt! A cold night in January became quite a bit warmer when Taynuilt Primary School invited family and friends to go on Safari around Africa! This was the culmination of two weeks’ work learning about the countries, culture and problems of the African continent. Each class chose an aspect of Africa that they would like to learn about and, every morning they worked in groups and with their class teacher to research answers to their questions. The children found out about many different countries within Africa, such as Morocco, Zimbabwe, South Africa and Ghana, and P6/7 studied the problem of Ebola. Our Nursery children learned about African fruits and animals through the story of Handa’s Surprise. Mrs Cindy Macdonald spent a week with us in school, telling us African stories and teaching us African Crafts. Every afternoon the children worked in Clan teams across the stages on a variety of different African crafts, including wire and beadwork, batik, silk painting, mask making and mapmaking. 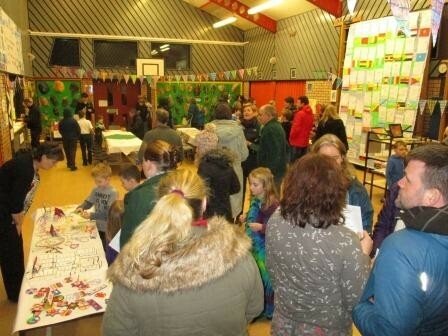 Safari Night was a chance to share all the learning and fun and showcase our achievements with family and friends. We also had a very important purpose; to share our good fortune with others who are not as lucky. Mrs Macdonald runs a charity called the Pelandaba Orphan’s Charity, which pays for 35 orphans in Zimbabwe to go to school, because unlike in Scotland, the Zimbabwean government does not pay for schools. At Safari Night we sold many of the beautiful paintings, scarves, jewellery and toys we made, Mrs Macdonald made African food to taste, we challenged visitors with a Safari Quiz and we even had an African dance. We raised the amazing sum of £902, which will pay for half a term’s schooling for the Pelandaba Orphans. When we look back we realised that we learned a lot, used many new skills and everyone had a great time. We are already thinking about our next whole school challenge!